Powers/Abilities: A normal human, Carl Melton had no paranormal physical abilities. An ichthyologist by profession, Melton had an extensive knowledge of marine life, and he was considered to be the leading expert in his field. His laboratory housed many fish tanks containing a variety of fish species. 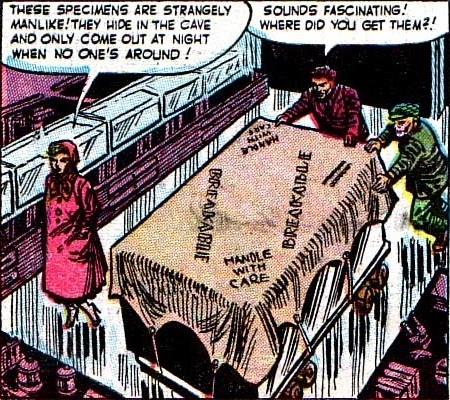 (Mystery Tales#9/1 (fb) - BTS) - The past of Carl Melton is largely unrevealed, but he studied fish and became an expert in ichthyology--although he always dreamed of discovering something new and unique to achieve fame, he had never been able to do so. (Mystery Tales#9/1) - One day, Miriam arrived at Melton's lab, riding in a delivery truck that transported a very large fish tank. Miriam told Melton that she and her uncle were also ichthyologists, and they had discovered a new species of fish off the Florida Keys; she claimed a museum had advised her to bring the fish specimens to Melton for study. As Melton and the truck driver wheeled the tank into Melton's lab, Miriam told Melton the fish were strangely manlike and hiding within a cave inside the tank, and they would only come out at night when no one was around. Melton invited Miriam to stay for lunch, and while they talked, she displayed a tremendous knowledge of sea-life; Melton offered her a position as his assistant, and Miriam agreed to stay for a while to help him with the new specimens she brought. At nightfall, Melton went into his lab and hid behind an adjacent tank, waiting for the new fish specimens to emerge from the cave. In the eerie night light of the tank room, he saw the three grotesque manlike fish swimming to the surface, then he saw Miriam (apparently unaware of Melton's presence) bending over the top of the tank, as though in conversation with the swimming horrors; he called Miriam's name, and the creatures promptly disappeared back into their cave. Melton questioned Miriam about the strange affinity she shared with the creatures, so Miriam removed the scarf from her neck and revealed her gills, then admitted she was actually one of the Fish People of "Lost Atlantis"! Miriam explained that when their city gradually sank beneath the waves in ancient times, her people had changed by the process of evolution to survive in their watery environment, and they became Fish People; she further elaborated that her people had eventually recovered the body of a drowned surface woman, then surgically altered Miriam, fashioning her into the drowned woman's likeness. 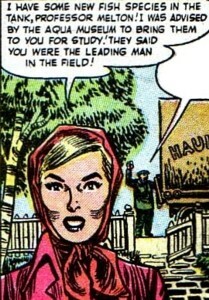 After completing her tale, Miriam tied her scarf around her neck and told Melton that since he knew the truth, she had to leave; but Melton thought to himself that he couldn't let her go because she was a unique specimen, and she could make him famous! Melton figured that since she was a female, Miriam would be susceptible to his romantic advances, so he began to woo her; pretending he was in love with her, Melton hugged Miriam and pleaded with her to stay--he had to hide his disgust of the fish-like odor she exuded. Suddenly, Miriam broke from their embrace and pointed to the large tank, warning Melton that the three Fish Men were emerging from it to capture him. Together, Melton and Miriam ran from the lab to the seashore, where they thought they had eluded the trio of pursuers. Melton thought to himself that he would keep Miriam believing he loved her until he could build an escape-proof tank to hold her, then the whole scientific world would be amazed by his Fish Woman specimen! As she stood on the moonlit rocks by the seashore, Miriam begged Melton to hug her and tell her how much he loved her again--not wanting to take any chances, Melton reluctantly complied, but all the while he was planning to bind Miriam with his necktie before she knew what was happening. But then Miriam jumped from the rocks, pulling Melton down with her into the water; they plunged deeper and deeper, and Miriam held Melton tight as he struggled for freedom. 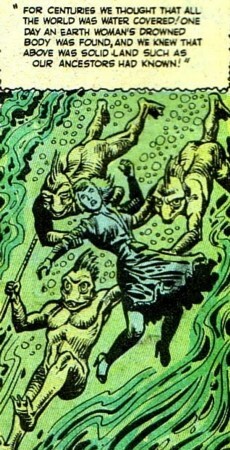 With his lungs screaming for air, Melton felt the scaled slimy hands of the three Fish Men seize him; he recalled Miriam telling him how she had been modeled from the drowned woman, and Melton guessed that the Fish People wanted to infiltrate human society, so they needed a surface man to use for a model! As he was pulled farther beneath the waves to drown, Melton's final thought was of the irony of his situation--he had hoped to capture Miriam for his specimen, but now it was he who would be the Fish People's specimen! Comments: Created by an unidentified writer and Joe Maneely (artist). Miriam and her fishy friends sure went through a lot of trouble--if they wanted a human male specimen, they could have just earlier grabbed that truck driver who delivered the big fish tank instead of waiting for the chance to capture Melton. The specific location of Melton's lab was never mentioned, but since Miriam claimed to have discovered the new species of fish off the Florida Keys, I'm assuming Melton's lab was located somewhere in the vicinity. 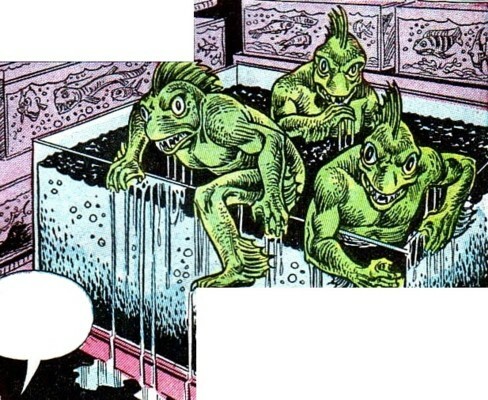 Perhaps the Fish People of "Lost Atlantis" had some connection to the Aquaticans (who were originally called "Atlanteans"), or to that undersea city discovered by explorer Jonas Case. This 6-page story -- The Specimen! 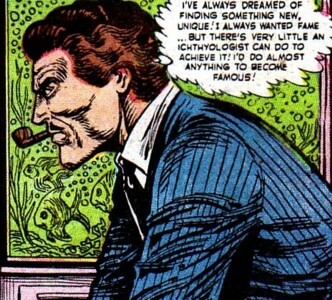 -- would be reprinted in Chamber of Chills#18 (September, 1975). 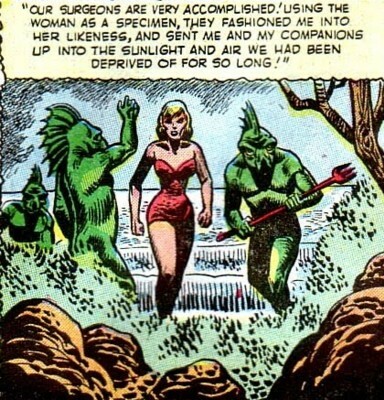 One of the Fish People of "Lost Atlantis," she had been surgically altered to resemble a human woman; she was amphibious and hid the gills on her neck with a scarf. 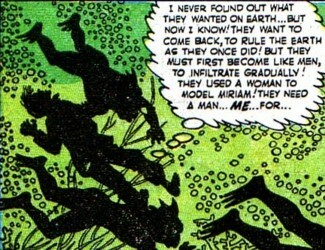 She went to Carl Melton's lab under the pretense that she was bringing him a new species of manlike fish she had discovered, but it was actually a plot for her and her three Fish Men companions to capture Melton. Miriam later ran off to the seashore with Melton when they were pursued by the Fish Men; then she pulled Melton into the sea because she wanted the fame and honor from her people for capturing him herself. Fish People of "Lost Atlantis"
They were the descendants of the human inhabitants of the city of Atlantis who had evolved into amphibious Fish People when their city gradually sank into the ocean. Their numbers were unrevealed, but they had an advanced civilization at the bottom of the sea. For centuries, they had believed that the entire world was covered by water; but when they found the body of a drowned surface woman, they realized that there was still land above the sea. Wishing to live in the air and sunshine as their ancestors once had, the Fish People formulated a plan to gradually infiltrate the surface world, and they began by having their surgeons alter Miriam into the likeness of the drowned woman. But the Fish People needed a surface man to use as a model, so three Fish Men accompanied Miriam to Carl Melton's lab to capture him. A large transparent rectangular tank, it contained three Fish Men hidden in a cave at the bottom of the tank. Miriam had it hauled to Carl Melton's lab by a delivery truck. As Melton and the truck driver wheeled the tank into Melton's lab, Miriam explained what it contained. Later, the three Fish Men emerged from the tank to pursue Melton and Miriam.